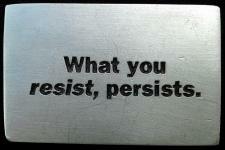 A beautiful hand-crafted pewter etched magnet with the "What You Resist, Persists" affirmation etched in black. It was created by a local Los Angeles artist with great care. The perfect gift for a friend, loved one, or family member who is a minimalist and likes things with clean lines. "No junky plastic fruit magnets on the fridge!" This upscale magnet is like a little work of art!!! Measures approx. 1 3/4" x 1".